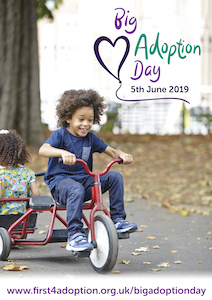 On Wednesday 5 June 2019, adoption agencies across England are invited to open their doors simultaneously to mark this year’s Big Adoption Day. As ever, the aim of the day is to promote adoption as a permanency option for some of our most vulnerable children and to build on the awareness raised during National Adoption Week. Building on the theme of last year, Big Adoption Day 2019 will continue to focus on Adoption Stories. Providing a opportunity for adopters and adoptees to share and celebrate their positive experiences of adoption and to counter negative depictions of adoption in the media and online. Agencies will be encouraged to invite adoptive parents to speak at information events & to use audio, video or written case studies to give prospective adopters a more rounded picture of the realities of adopting a child or siblings. You can find details of all Big Adoption Day events, along with information events throughout the year, in our events calendar. To assist agencies with the promotion of the event, we have created a range of marketing materials. Send us the details of your event by filling out the form below so we can add it to our events calendar and promote in the run up to the 21st on social media. The Big Adoption Day is a CVAA initiative but all adoption agencies and local authorities are invited to take part. There is a text limit of 3000 characters. Any additional downloads you'd like to include. Preferred contact number for public contact for the event. Do you want to include an email address for people to contact you on? Please give the address of where the event is being held. Name of agency holding the event. Do you have more than one date for this event? How many dates do you have in total?